By inheritance to the sitter's great-nephew, Baron Jérome Pichon; (his sale, Hotel Drouot, Paris, 29 March-10 April 1897, no. 1009); Joseph Bardac, Paris; (Galerie Seligmann, Paris); sold 21 February 1911 to Peter A.B. Widener, Lynnewood Hall, Elkins Park, Pennsylvania; inheritance from Estate of Peter A.B. Widener by gift through power of appointment of Joseph E. Widener, Elkins Park, Pennsylvania; gift 1942 to NGA. According to German Seligman, Merchants of Art: 1880-1960, Eighty Years of Professional Collecting, New York, 1961, p. 13, it was Sigismond Bardac who sold the busts to his father, Jacques Seligmann. . However, according to René Gimpel, Diary of an Art Dealer, New York, 1966, p.7-8, it was Joseph Bardac, Sigismond's brother, who owned both the marbles of the Brongniart children and the terracottas; Gimpel sold the terracottas to Widener. 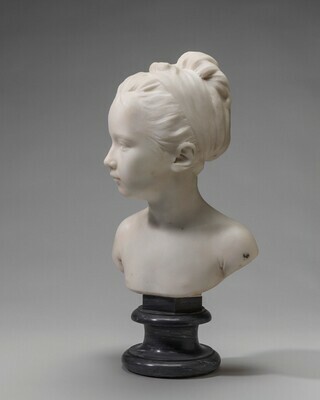 See notes of Charles Seymour, Jr., about busts by Houdon in the NGA collection, and the letter of 17 January 1911 from Joseph Bardac to Jacques Seligmann, in NGA curatorial files. Obras Maestras de la National Gallery of Art de Washington, Museo Nacional de Antropología, Mexico City, 1996-1997, unnumbered catalogue, 94-95, color repro. 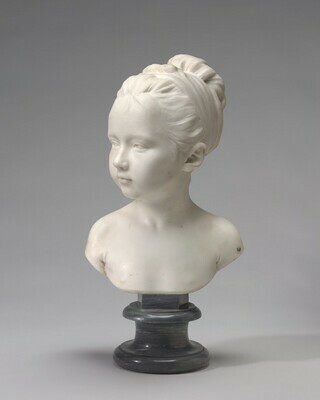 Exhibition of children's portraits held in conjunction with Jean-Antoine Houdon (1741-1828): Sculptor of the Enlightenment, The J. Paul Getty Museum, Los Angeles, 2003-2004, no cat. Giacometti, Georges. Le statuaire Jean-Antoine Houdon: et son epoque (1741-1828) 3 vols. Paris, 1919:2: 4, 25. Vitry, Paul. "L'éxposition du centenaire de Houdon à Versailles." La Revue de l'art ancien et moderne 53 (1928): repro. 20. Maillard, Elisa. Houdon. Paris, 1931: 28-29. Works of Art from the Widener Collection. Foreword by David Finley and John Walker. National Gallery of Art, Washington, 1942: 8, as Louise Brongniard. Paintings and Sculpture from the Widener Collection. National Gallery of Art, Washington, 1948 (reprinted 1959): 138, repro., as Louise Brongniard. Seymour, Charles. Masterpieces of Sculpture from the National Gallery of Art. Washington and New York, 1949: 183, note 53, repro. 163-164. Seligman, Germain. Merchants of Art: 1880-1960, Eighty Years of Professional Collecting. New York, 1961: 13, repro. pl. 21. Réau, Louis. Houdon: Sa vie et son oeuvre. Paris, 1964: 26-27, 95, 412-413, no. 92, repro. pl. XLV 93E. Summary Catalogue of European Paintings and Sculpture. National Gallery of Art, Washington, 1965: 158. European Paintings and Sculpture, Illustrations. National Gallery of Art, Washington, 1968: 140, repro. Walker, John. National Gallery of Art, Washington. Rev. ed. New York, 1984: 645, no. 1020, repro., as Louise Brongniard. Sporre, Dennis J. The Creative Impulse: An Introduction to the Arts, 3rd ed. Englewood Cliffs, NJ: 1993: 359-360, repro. Sculpture: An Illustrated Catalogue. National Gallery of Art, Washington, 1994: 109, repro.